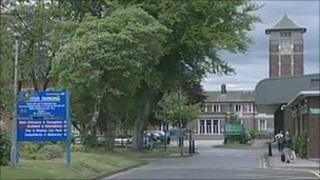 The birthplace of the NHS could be privatised, according to health managers in Greater Manchester. Trafford General Hospital treated the first ever NHS patient when the health service was inaugurated in 1948. Trafford Healthcare NHS Trust has now confirmed that privatisation is being considered as way of dealing with the hospital's mounting debt. Meanwhile, claims that Whiston Hospital on Merseyside could also be handed over to the private sector have been denied. In 2008, Trafford General was at the heart of celebrations marking the 60th anniversary of the NHS. However, two years later, Trafford Healthcare NHS Trust said it was currently involved in a process of selecting a partner "to secure the best deal for patients in Trafford". A trust spokesman said: "Our strong preference is to be acquired by one of our neighbouring foundation trusts and we are currently engaged in a process to achieve that. "If, however, for some reason this does not prove possible we will move to an open process. "This would involve inviting other NHS trusts and social enterprises to bid to acquire us as well as the private sector." Claims that both Trafford General and Whiston Hospital could be put in private hands were made by Labour MP for St Helens Dave Watts who said he had seen documents on the matter. Image caption Health minister Aneurin Bevan visited Trafford in 1948 on the day the NHS was born. He described it as "a major issue" and called on the government to discuss its plans for the NHS openly. "I think that's why the government has been sneaky about it," he said. "They are not having these discussions with the general public; they are having it behind closed doors and in secret meetings with secret documents." In a statement, the Department of Health said it was "in discussions with the North West Strategic Health Authority about how best to continue to ensure that services remain sustainable and viable". Whiston Hospital recently underwent a £250m rebuild funded via a private finance initiative (PFI). Mr Watts said he had seen documents listing three options; a £20m cash injection; merging with a neighbouring hospital and transferring to a private firm. But St Helens and Knowsley Hospital NHS Trust said that, while it was drawing up plans to achieve foundation status by 2014 in line with government policy, those plans did not include developing a relationship with the private sector.